What are the pros and cons of BigCommerce? It has one of the more robust entry plans among ecommerce platforms and a bit higher-than-average price point. Is this an advantage or disadvantage? In this article, we take a closer look at one of the top ecommerce players in the market today. Its features, pricing, and scalability, among others, are dissected and explained to show you why they are a win for most sellers, and might not be on rare occasions. With staggering numbers behind global ecommerce, it’s reasonable to assume that this highly convenient way of selling and buying things, put simply, has already taken over the world, and only an unlikely internet catastrophe stands on its way to total global dominance. As it is, it already commands around $2.8 trillion global sales in 2018, and is expected to double by 2021. In the US alone, statistics show about 259 million of the population transacting their purchases through ecommerce platforms, each one spending an average of $1,952 each year (compared with other nations, below). Such numbers put into proper context the raging competition observed among ecommerce software providers vying to be the platform of choice for millions already comfortable completing their groceries, buying that elusive gift from a specialty store all the way from Tibet, or just shopping for the finishing touches to an ongoing interior design project. Also in the US, at least, Amazon reigns supreme as the channel of choice for all ecommerce deals inside the country. No wonder then that if you’re an ecommerce software provider, you cannot afford to launch a product that does not offer an effective way to integrate with Amazon; you also cannot ignore eBay in the conversation. And if you’re a seller, establishing an Amazon or eBay presence is almost a given, unless you have a strong route to your market, to begin with. There are a number of leading ecommerce applications with new ones entering the field all the time, while new acquisitions or mergers can be seen taking over the headlines as important players look for more effective ways to position themselves in the market. BigCommerce is easily one of these leading players. 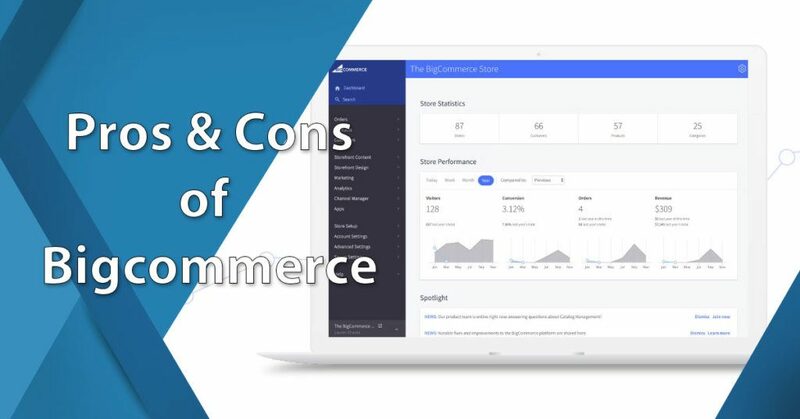 If you happen to be on the market for an ecommerce platform, the succeeding discussions about BigCommerce pros and cons should help you determine whether to include the application or not in your shortlist. You may also check out our list of leading ecommerce solutions; you will probably find what you are looking for among the many top-tier applications featured there. BigCommerce is one of the leading ecommerce solutions in the market. It’s shown steady growth within its ten years of existence, with strong features constantly updated to incorporate the latest technologies that are critical to any business relying on online stores as primary sources of revenue. The vendor offers a comprehensive free trial to get you up to speed with the features. You can easily sign up for the BigCommerce free trial here. The SaaS application covers all the essential areas of ecommerce software, from contemporary, professional design templates that it provides out of the box, or for more design-savvy users, a sprawling complex of expertly designed templates right out of its theme store, to advanced shipping arrangements and payment gateway options. BigCommerce also includes sophisticated marketing tools, expansive integration with third-party applications, mobile device access, and powerful analytics engine all wrapped up in an easy-to-use, intuitive interface. With its comprehensive payment gateway options, powerful shipping platform, and easy integration to major sales channels, BigCommerce is well positioned to guide your web store business to success. Let’s dig deeper into its major strengths while taking care to note terms that you should discuss further with the vendor. The matter of price is an essential factor to consider when examining BigCommerce pros and cons. In the case of this software, you can start a powerful ecommerce journey for a mere $29.95 per month. BigCommerce’s Standard starter package gives you unlimited staff accounts, unlimited file storage, and bandwidth, to ensure your operations are not held back by sluggish connection and limited storage capacity. In particular, you want to pay attention to specific limitations for each plan. For example, the vendor puts a 1,000–2,000 order limit per plan, beyond which you can expect the vendor to prompt you for an upgrade. You could view this setup both ways: on the one hand, you being asked for an upgrade means that you are definitely getting more orders and consequently growing; on the other hand, it informs you that expansion and growth come with their own costs. Business, however, is always about costs and returns, and if you are making hundreds of thousands in sales for a few additional fees, then it still amounts to a good deal and a fruitful investment. One of the first things you’d expect from your purchase of an ecommerce tool is a bundle of design tools to make your online store more visually appealing. BigCommerce offers two routes for you in this regard: one is via the out-of-the-box themes carefully selected by the vendor. The templates, more than 80 of them, cater to popular design tastes, useful if you want a decently presentable website within a short time. If you prefer to go the extra length of fully customizing the visual layout of your online store, then BigCommerce has just the theme store for you, where you get thousands of more themes to choose from, all of them already categorized for your convenience. Opt for free or paid templates, conveniently categorized for easy selection. If you are already using Sass and Webpack development tools, then you would be happy to know that BigCommerce offers just these tools to allow you to finish designing your website quickly. BigCommerce gives you the distinct advantage of tight integration with ShipperHQ, which boasts the most powerful rules engine and shipping rate calculator in the industry. The close partnership enables you to use real-time shipping quotes, sophisticated shipping platforms, and external fulfillment services. Excessive shipping quotes can easily hurt your business, but this BigCommerce shipping solution spares you from such a potential major business headache. BigCommerce works seamlessly with ShipperHQ, for a powerful shipping platform. There is no way your online commerce could thrive if your store is prone to intermittent downtime so that new and old clients alike can’t see your store and do business with you. You are practically losing business while spending a considerable amount of time wondering what’s wrong with your ecommerce solution. BigCommerce protects your business interests with multiple layers of security, from 24/7 human monitoring to the most sophisticated intrusion detection software, file integrity scanner, and the strongest firewalls to secure your server. For additional security, BigCommerce provides DDOS protection and Level 1 PCI-compliant hosting. BigCommerce leaves it to you to choose from among the major payment gateway solutions, including Visa, PayPal, Square, Stripe, Apple Pay and Amazon Pay. You don’t have to worry about being locked into any proprietary payment gateway, extra transaction fees, and penalties. The easiest setup path is with PayPal, and it comes with preferential payment rates for credit card transactions: the rates are so structured so you pay less the higher you go up the BigCommerce pricing tier. Conversion rate optimization (CRO) tools give you powerful avenues to grow your business and resolve recurring issues that directly affect your sales revenue. BigCommerce’s abandoned carts recovery tool, for example, lets you automatically send emails to shoppers who abandoned their carts while shopping on your online store. You can customize the content of the emails, but their main purpose is to motivate the shoppers to complete the purchase. Aside from this solution to abandoned carts, BigCommerce eliminates complicated steps in the checkout process, making way for shoppers to complete their purchase faster. To capture new customers and encourage loyalty among current ones, BigCommerce comes with discount tools and coupons that you simply set up right in the application’s control panel. Set up discount promos easily right inside the control panel. You may well have a stable business going with just your main store, but selling to any country in the native language gives you a latent revenue source that you would simply miss otherwise. Combine this with the flexible payment gateway options and you have a compelling ecommerce solution that gives you unlimited growth avenue. Its built-in tax calculator is also calibrated to the guidelines of more than 150 countries, so there’s less hassle for your business in this regard. If you are going into ecommerce, your first objective should be to establish a presence in all the major channels to create a wider awareness of your brand and gain at once a high revenue stream. BigCommerce paves the way for you to easily accomplish this, with strong integration with eBay, Amazon, Google, Facebook, Instagram, and of course all the shipping and payment tools already discussed above. Your monthly subscription comes with business reports on key metrics that affect the performance of your online store. The marketing reports let you pinpoint the most effective marketing channels, while customer reports show the core demographics of your customers, useful when developing campaigns. There are reports that reveal the details on shopping cart abandonment, allowing you to design effective followup emails to potential shoppers or rectify flaws in your site’s user experience design. BigCommerce has a great reputation for its customer support, which covers every aspect of it user-base needs, from onboarding services, email, live chat, and phone support for any technical issue that may arise. The foregoing discussion on BigCommerce pros and cons clearly shows a mature application that is fully equipped to handle any ecommerce needs, both basic and advanced, with helpful tools to make your foray into online selling more productive than if you decide to host your own shopping cart system. To prevent some bumpy ride with the application, you need to pay careful attention to the package bundle that you are subscribing, particularly in those areas where limitations are clearly spelled out. Should you want to investigate the platform firsthand, you can easily do so when you can sign up for the BigCommerce free trial here.